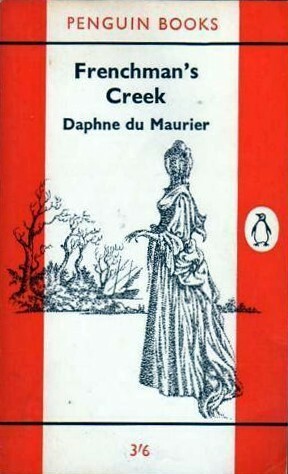 I’ve read a number of books and short stories by Daphne du Maurier but Frenchman’s Creek is quite a bit different. Du Maurier once said that the only romance she ever wrote was Frenchman’s Creek. Romance purists might argue with that assessment, for while much of the story is romantic not all the markers of a romance are there. The heroine, Dona St Columb, is an entitled and bored aristocrat living at Court with her husband and 2 children during the Restoration (though it’s rather vague about the when). She’s not like other married ladies though. She has a reputation for mischief, entering bawdy houses dressed as a man with her husband and his friends. The guys love her, even if they are a little scandalized by her behaviour. Her latest adventure gives her pause after she terrifies a little old lady during one of her pranks. Dona has an epiphany: this is not the life she wants to lead. Dona leaves the city and heads for her husband’s estate in Cornwall, just her and the kids. She plans some quiet alone time, sleeping late and avoiding the usual country pleasantries like visiting the neighbours, but peace and quiet are not to be. A neighbour warns her that a pirate is on the loose! A French pirate at that- the worst kind! He’s been robbing the county hoity-toities blind. Little does she know that this blood thirsty pirate has been hiding out in the creek near her home. But wait! Turns out this pirate’s reputation has been exaggerated. The Frenchman is a true gentleman, suave and debonair, and like Dona he is a free spirit. It seems that she’s found a bosom pal in the Frenchman. Will Dona turn to a life on the high seas? Frenchman’s Creek is literary Calgon. (Calgon! Take Me Away!) Who needs Christian Grey of the Shady novel while there’s the Frenchman? Handsome, cultured, and very understanding. He knows what Dona wants before she does. Plus, he’s a rich pirate. Who wouldn’t think about sailing away with him? For Dona, the Frenchman comes along at the right moment. She’s having a crisis. Pushing thirty, she sees that the life she’s lived up until now has been filled with frivolity. She married her husband because she liked his eyes. Not much to start a marriage on. Yet, she still yearns for adventure and freedom. There was something about this that bothered me (two somethings, actually) and while I sometimes sympathized with Dona’s need for freedom, I didn’t like where things were going. Dona does get her head together and redeems herself, no more frightening old ladies for her, and all it took was a brush with the Frenchman. Something I found interesting about Dona was her propensity for dressing like a boy. There is physical freedom in the clothing but also a social freedom in becoming male. Dona wishes that she could be a man and sail away. Daphne believed herself to have a male side to her personality and claimed it gave her the creative energy she used for writing. Maybe she felt that this male side gave her permission to do things that a proper lady could not, much like Dona did. An adventurous story of the life of a pirate had extra appeal for Daphne and as well as her readers, who were suffering through World War II at the time of her writing Frenchman’s Creek. If you’d like to temporarily escape with a handsome pirate and some excellent writing, pick up Frenchman’s Creek. You won’t regret it. I wouldn't mind escaping with a handsome pirate! I think I own this one, but haven't read it yet. Must rectify this! Yes, handsome pirates make everything better! This like all the other Du Mauriers was so good. It's hard to find a bad one from her. I agree, handsome pirates make everything better. It's quite a bit different from most of her other work. I didn't like this one as much of some of her others, but it's not bad. I've read this a couple of times and I do love the romance of the Frenchman. I also like the 1940's movie starring Joan Fontaine and the 1990's masterpiece movie starring Tara Fitzgerold. My English teacher in high school loved this novel and convinced me to read it when she saw me reading Rebecca. I did not regret it!